You will note above that a Crusin’ live show is in Muscatine is coming up on St. Patrick’s Day. If you are in Eastern Iowa, check it out. We have a Riverside Casino gig coming up in April – stay tuned. More nice stuff turning up on the net about M.A.C. projects new and old…. Janet Rudolph of Mystery Readers International kindly asked me to do a guest blog last week about the collaborative process (now all three of us have written such pieces – Barb, Matt and me). In case you missed it, now’s your chance. Mel Odom, a gifted scribe his own self, has posted a nice YOU CAN’T STOP ME review. This appeared lots of places, but we’re linking you to Mel’s entertaining Bookhound site. Out of the blue, a really nice review of my DVD, ELIOT NESS: AN UNTOUCHABLE LIFE ( ), has turned up form Cold Fusion Video Reviews. Lots of pics and apt praise for the great Michael Cornelison. There is a Ten Classic Private Eyes thread at Tony Isabella’s message board. Tony, by the way, is another great guy. Nate Heller and Ms. Tree come up several times, and I even responded a couple of times. Worth looking at. My pal Chris Mills has posted a lovely tribute to Mickey Spillane. Just a few moments ago I finished THE WAR OF THE WORLDS MURDER and, smile still on my face, I thought I’d drop you a note of appreciation. As with everything of yours that I’ve read I enjoyed it tremendously. The craftsmanship required to produce such little gems as your “disaster” novels shows through on every page. I also must say that as much as I enjoy the novels themselves I find your Acknowledgements a special added pleasure. You write so vividly and set the literary stage so lavishly that I invariably find myself hunting up further information on the times and characters about which you write and I often find myself checking out your source material. I, like you am a bit of a history and media buff and have been an admirer of both Welles and Gibson for some time. So during my reading of War of the World Murder my interest in them was reawakened and I poked around some of my books and some internet sites about them and was again impressed with the depth of your research. In so doing I found a (very tenuous) connection between myself and Gibson. I read that he spent the last years of his life in a very small upstate NY community of Eddyville. When I was a child I spent every summer in Rosendale, NY, the town right next door to Eddyville. My parents live there today. From the descriptions that I read it sounds like Gibson’s house was a bit like Forry Akerman’s Akermansion, only writ small. I was unable to find any pics of the house on the internet but last week I went to see my parents and made sure to travel Creek Locks Road in Eddyville looking for a house that matched the description I’d read. Eddyville is quite small and I was able to narrow it down to only two possibilities. Even here in my fully adult years I was able to get a bit of a thrill knowing that the man who created (for all intents and purposes) The Shadow lived in one of those two houses, so close to where I’d spent so much of my childhood. It isn’t a big thing, but it is a nice thing and I owe that small satisfaction to you for having made Gibson and his his fictionalized involvement with the War of The Worlds broadcast so real for me. thanks for your lovely e-mail. I’m very proud of my historical stuff, and it pleases me that readers are seeking the books out years later. 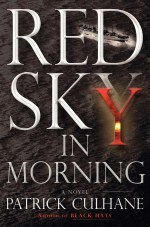 A book you may not know about that is in a way the capstone to the disaster series is RED SKY IN MORNING by Patrick Culhane. That’s actually me. It’s based on my father’s very interesting experiences in the Navy during WW 2. You should probably seek out, if you haven’t already, the two books I did recently about the history of comics: A KILLING IN COMICS and STRIP FOR MURDER. They did not do well, so there probably won’t be any more of ’em, but you will like them, I think. I have gone on many adventures like the one you describe. There’s something about connecting to childhood enthusiasms as an adult that’s very special. These are the things that resonated through our lives and, for better or worse, made us who we are. I have essentially shut down my Facebook “Friends” page, which I was completely incompetent in handling, and – at Nate’s insistence and with his help – have set up a Fan page. If you are reading this, and are on Facebook, please sign up. I comment on many of the posts and post there fairly frequently. 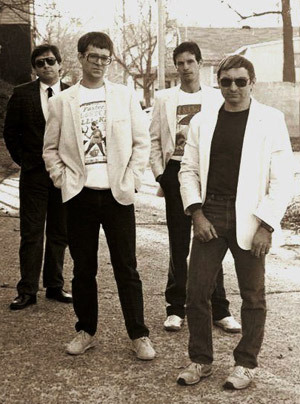 I just (with bandmate Chuck Bunn’s help) put up a whole series of pics about the history of the Daybreakers and Crusin’ – even if you’ve never heard my band, you may get a kick out of these. Now I am headed back to work on my draft of ANTIQUES KNOCK-OFF by Barbara Allan. By the time you read this, G.I. JOE will have hit theaters, and I’ll have seen it, and so will some of you. This is one of the most eagerly awaited — and vilified — movies of the summer. I have no idea whether it will be good or bad, but I’m fairly confident it will be entertaining. 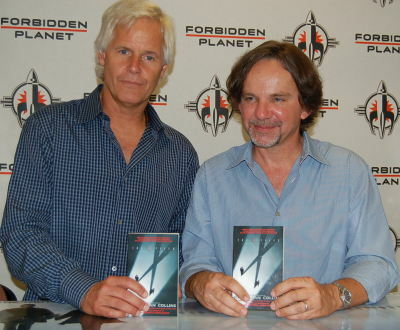 I have written four other novels for Stephen Sommers movies, and none of the screenplays have seemed liked masterpieces to me, and yet they all made entertaining movies…and books. My two G.I. 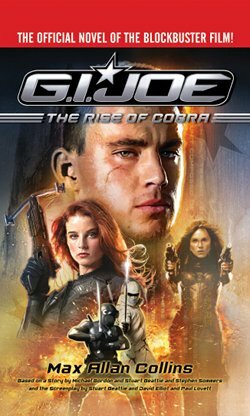 JOE novels have been out for quite a while, but they should get a boost from the film’s release. I think the books are fun, and am particularly happy with the prequel (which Matt Clemens helped me with). Creating a novel out of an action-heavy, stuff-blows-up screenplay is harder than, say, adapting and expanding THE X-FILES: I WANT TO BELIEVE or AMERICAN GANGSTER, which are more suspense and character-driven. But getting to do a prequel helped the novelization work better. Ron Fortier, a terrific reviewer, really got what I was going for in his dual review. 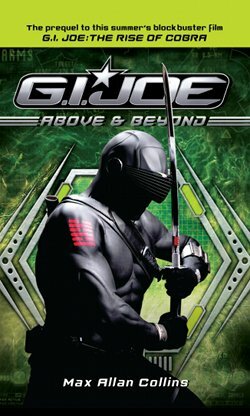 One of the complaints about the film (from people who hadn’t seen it yet, though some had read my novelization, which generated web interest) is that the rebooted G.I. JOE organization is international, not American. The very American term G.I. Joe comes from World War Two and may have been coined by David Breger, who did a cartoon under that name and another called PRIVATE BREGER (which had a long post-war civilian run as MR. BREGER). The film script addressed that problem by making two American G.I.s the central characters, and my prequel novel emphasizes those characters (Duke Hauser and Ripcord Weems) even more. While we’re on this military note, I should point out that my World War Two naval thriller, RED SKY IN MORNING, based on my father’s experiences in the Pacific, is out in paperback with a handsome new cover. I will use the occasion to reveal that the “Patrick Culhane” penname was not my idea, and was to a degree forced upon me, and I have no plans to use it again. I regret that my real byline is not on this very personal novel, or BLACK HATS for that matter, which is one of my most commercial. And while RED SKY IN MORNING is a title I came up with, my original title — U.S.S. POWDERKEG, which I liked very much — was rejected. One of the great frustrations of the writing life is having a title that you have lived with and woven into a book spurned by an editor (or a sales force). I would be thrilled to see the book reprinted at some point with my preferred title and my real byline…but for now, you need to look for the Culhane byline on this one. This is probably my record year for number of books published (and for me that’s saying something, I know). But I’m really proud of what Barb and I have accomplished of late, and want to make sure you’re aware of what’s out there already, and what’s coming. 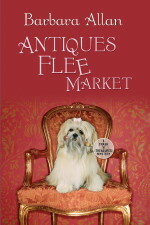 In September from Kensington, “Barbara Allan” (Barb and me) will have the reprint of ANTIQUES MAUL (ISBN 978-0-7582-1194-1) out and the new “Trash ‘n’ Treasures” mystery, too: ANTIQUES FLEE MARKET (ISBN 978-0-7582-1195-8), with a Christmas theme. It’s been getting the best reviews of the series yet. These are funny cozies with an edge, and fans of my tougher stuff may be surprised by how much they’ll enjoy these…and we’ve just signed to do two more! 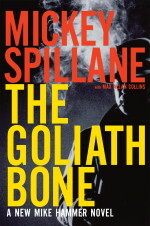 Very soon Harcourt will publish the first new Mike Hammer novel in over a decade — THE GOLIATH BONE (ISBN 978-0-15-101454-5), which I completed from Mickey Spillane’s nearly finished manuscript. This is the first of at least three Hammers I will complete from manuscripts Mickey entrusted to me. To say this is an honor and a thrill is an extreme understatement. It’s also getting great advance notices. Do not miss this one! The success of THE LAST QUARRY (which has been made into the film THE LAST LULLABY, on the festival circuit now) has led to the new prequel, THE FIRST QUARRY (ISBN 0-8439-5965-7), which Hard Case will publish in paperback in the fall. This is also getting wonderful advance reviews. This one is definitely not cozy, and could be the nastiest noir novel I’ve ever written…. STRIP FOR MURDER from Berkley Prime Crime — a snazzy trade paperback, a Rex Stout-style mystery that combines graphic novel elements (my longtime MS. TREE cohort Terry Beatty did the comic art), and is a lot of fun. The story is loosely based on the notorious Al Capp (Li’l Abner)/Ham Fisher (Joe Palooka) feud. 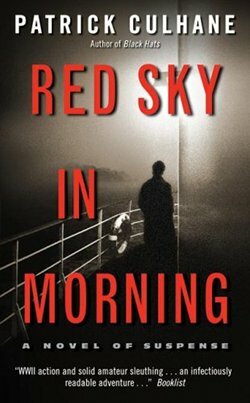 RED SKY IN MORNING (ISBN 978-0-06-089255-5) is by “Patrick Culhane” — the byline I began with the Wyatt Earp/Al Capone novel, BLACK HATS (in mass-market paperback now, ISBN 978-0-06-089254-8). This one is special to me, a book I’ve planned for decades based on my father’s experiences in the Navy in WW 2 as a young officer in charge of black sailors handling explosives in the Pacific. It’s my CAINE MUTINY, hinging on the infamous Port Chicago disaster, but there is a mystery. You may have this on the way — please don’t miss RED SKY. EQMM’s Jon Breen says it’s one of my best. In movie/TV world, my New York Times bestseller AMERICAN GANGSTER picked up the “Scribe” for Best Novel at San Diego Comic Con from the International Association of Media Tie-In Writers. Current tie-ins of mine included THE MUMMY: TOMB OF THE DRAGON EMPEROR (ISBN 978-0-425-22313-0) and X-FILES: I WANT TO BELIEVE (ISBN 978-0-06-168771-6), and the second CRIMINAL MINDS novel, KILLER PROFILE (ISBN 978-0-451-22382-1). The third CRIMINAL MINDS, FINISHING SCHOOL (ISBN 978-0-451-22547-4), is out in November from NAL (my fave of the 3). In non-literary news, I’m thrilled to report that my ’60s garage band, the Daybreakers, has been inducted into the Iowa Rock ‘n’ Roll Hall of Fame. Over the Labor Day weekend, we appeared with seven other inductee bands in concert at Arnold’s Park on Lake Okoboji, to a packed house of over 1000 rock fans. What made this truly special was that the original line-up of the band — guitarist Mike Bridges, bassist Chuck Bunn, guitarist Dennis Maxwell and drummer Buddy Busch (and me) — were able to assemble from around the country and reunite both to be honored and to perform for the first time together since 1968. We did half an hour and, frankly, we killed — a magical set in which we took a major risk, doing mostly original material at an oldies show! Of course, our major claim to fame nationally (make that our only claim to fame nationally) was our infamous single “Psychedelic Siren”/”Afterthoughts.” “Siren” is one of the most anthologized garage-band songs of the ’60s, currently available on a Sundazed CD called GARAGE BAND ’66: Speak of the Devil. We managed to reproduce the siren sound on stage and the crowd went nuts. We also played live, for the first time, “I Need Somebody,” an original written by our late great bandmate, Bruce Peters. 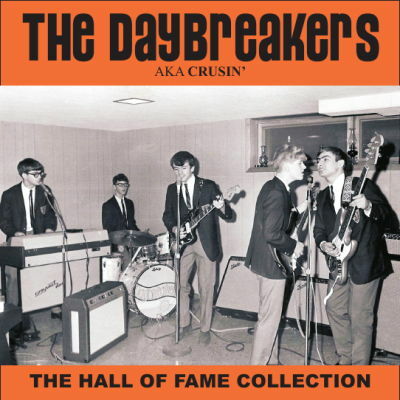 A limited edition of 100 CDs called “THE DAYBREAKERS aka Crusin’ — The Hall of Fame Collection” was pressed for the show. This is essentially the long-out-of-print “Thirty Year Plan,” and is filled with Daybreakers/Crusin’ recordings, studio, demo, live, from 1967’s “Psychedelic Siren” to the ’90s songs from the “Mommy” movies. We have about forty of these left. For $15 postpaid (plus $7.50 for shipping outside the U.S.), you can get a copy of “The Hall of Fame Collection.” For $25 (plus $7.50 for shipping outside the U.S.), you can get a copy signed by the entire band (there are only 15 of these). We have uploaded footage of “Psychedelic Siren” from our Hall of Fame performance. Check back soon for more clips! And Crusin’ has added Daybreaker bassist Chuck Bunn to the mix, and will be performing more in the midwest than in recent years. Stay tuned!